When it hits the fan and your life is on the line, the last thing you want to have on your hip is a gimmicky holster made of cheap plastic with parts that may fail you in a time of crisis. You need a gun holster as reliable as the firearm you trust, that also helps your gun disappear in comfort when you conceal it from prying eyes. 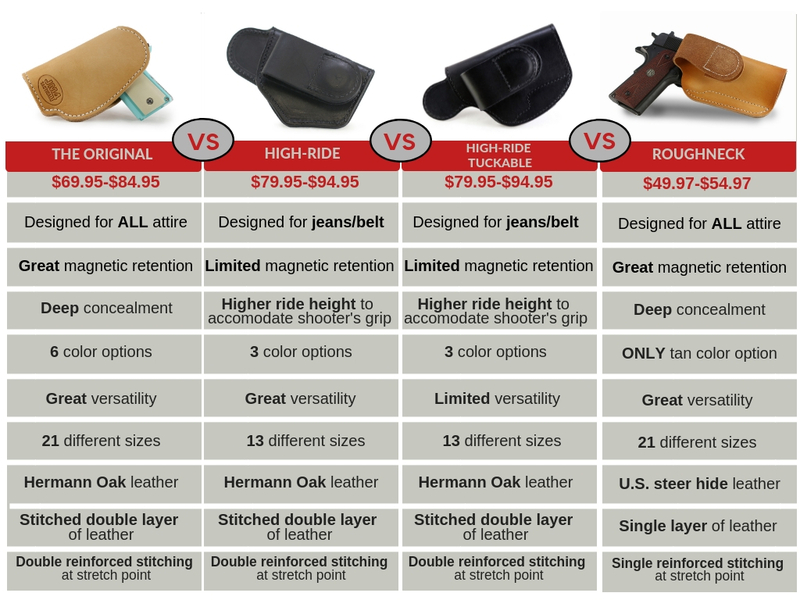 The first function of these magnets is to click into place on your waistband. This allows these concealment holsters to stay right where you put them, anywhere on your waist. I really love this holster for my Sig P365! It is super comfortable and has a great fit and finish. The quality is obvious when you get your hands on one. I thought the magnetic retention would be somewhat "gimicky", but I was totally wrong. The magnet is very strong and far exceeds expectations. This holster is so easy to put on, take off, and adjust. I wish that I would have tried this holster a long time ago! I now have 3 of these and they are the best holsters I've used. I like that they are so easy to adjust and remove. I love these holsters and are by far the most comfortable I have found. My fist is 1 year old and has seen rough daily carrry. It is still in great condition. I wanted to get a little smaller in my carry gun and purchased a sig P365. I knew j4m was the holster I wanted for it. I used the look up chart and ordered one. Great holster as I expected. The gun fits snug and does not slip. I wish there would have just a little more length to cover the muzzle some and soften the edges when tucked into the waist band. The muzzle sits right at the end of the holster. Great product though and way more comfortable than kydex. Best holsters I've ever used and most comfortable. That's why I come back again. My second one to purchase and love them both. I carry my Sig P365 is this holster, and it fits and Carrys perfectly. Bought this for wife's latest acquisition. Sig P365. This is her 3rd holster. from JM4. She adores these holsters. Wouldn't bat an eye at future purchases. Another excellent holster from JM4 Tactical. The leather is sturdy and the stitching is top notch. It fits the P365 perfectly. The magnetic retention is superb as always. Just buy it if you are on the fence about it. I tried a more well known holster first, and was not satisfied. After doing a little research I’m so glad I found this beauty. Perfect holster for my daily carry. Works with everything I wear, from jeans to suits, to gym shorts. Love the versatility. This holster is well made. You will not be disappointed.